As part of the lead process in SAP Hybris Marketing Cloud, you can define Lead Transfers and campaigns with action “Create Lead” to trigger the creation of leads in SAP CRM for contacts which are target group members. Some SAP Hybris Marketing Cloud contacts might have a reference to a SAP CRM business partner, and some not. For contacts which do not have a reference to a SAP CRM business partner a SAP CRM business partner is created together with the lead one order business document. In SAP CRM, address checks dependent on the country of the address can be configured. Dependent on the business requirements it can be desired to suppress these address checks for business partners being created within SAP Hybris Marketing Cloud lead process. 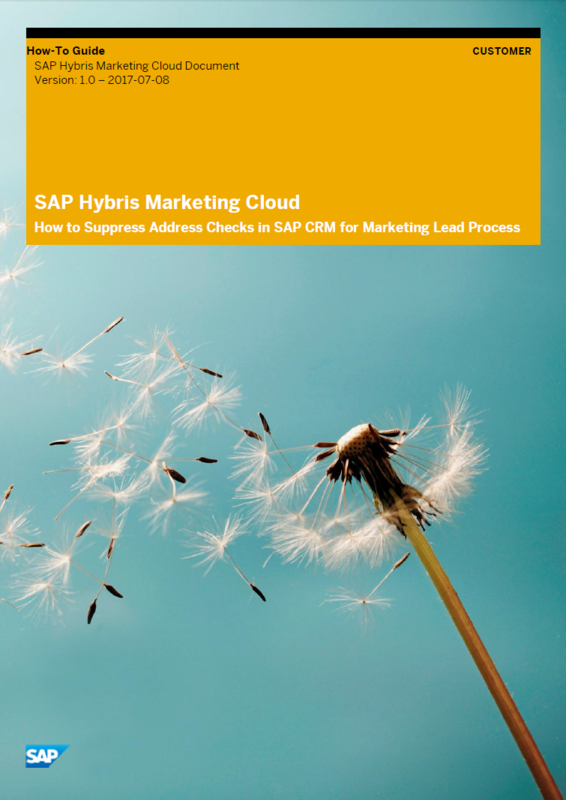 This how-to guide is intended for customers and partners who are facing the requirement to suppress country dependent address checks for business partners which are imported via the SAP Hybris Marketing Cloud lead process to SAP CRM.